I’m more of a cook than a baker. So while I have an arsenal of dried herbs and spices and savory condiments, my baking cupboard is slightly more bare. Since I don’t keep tabs on what’s in there, there have been times that I’ve realized that I’m missing a ingredient or two after I’ve already embarked on a baking project. While I have a grocery store less than a mile from my house, it’s usually not worth the inconvenience to me to go get what I’m missing—especially when I have a perfectly good substitute in my kitchen already! Here are 7 no-fail baking substitutions you can make without ruining your recipes. What to substitute for buttermilk: If you don’t keep buttermilk on hand, you have a couple of options. You can swap 1 cup nonfat or low-fat milk mixed with 1 tablespoon lemon juice or vinegar for each cup of buttermilk. 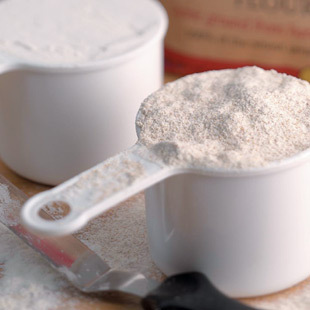 Or keep a can of nonfat buttermilk powder in your refrigerator—look for it in the baking aisle. Mix according to package directions. Plain yogurt also will work as a buttermilk substitute. What to substitute for whole-wheat flour: While we love the whole-grain properties of whole-wheat flours, if you run out while baking, you can substitute an equal amount of all-purpose flour. What to substitute for sour cream: If you’re out of sour cream (or don’t normally buy it) but have plain yogurt in your fridge, you can swap it cup for cup. What to substitute for butter: Whether you run out of butter or just want to make your favorite baking recipe healthier, here’s a rule of thumb: Try substituting canola oil for up to half the butter in cakes or other baked goods. Replacing some of the butter with oil reduces the overall saturated fat in a recipe. What to substitute for brown sugar: Brown sugar has a nutty, caramelized flavor that is best mimicked by combining 1 cup of granulated sugar with 2 tablespoons molasses. What to substitute for baking powder: You thought you had baking powder but you really had baking soda. (Why do their names have to be so similar?!?) Replace 1 teaspoon baking powder with 1/2 teaspoon cream of tartar plus 1/4 teaspoon baking soda. What to substitute for vanilla beans: If your eyes popped out of your head when you saw the price of vanilla beans, don’t fret. You can substitute 2 teaspoons of vanilla extract for each vanilla bean. What on-the-fly baking swap have you made that worked?